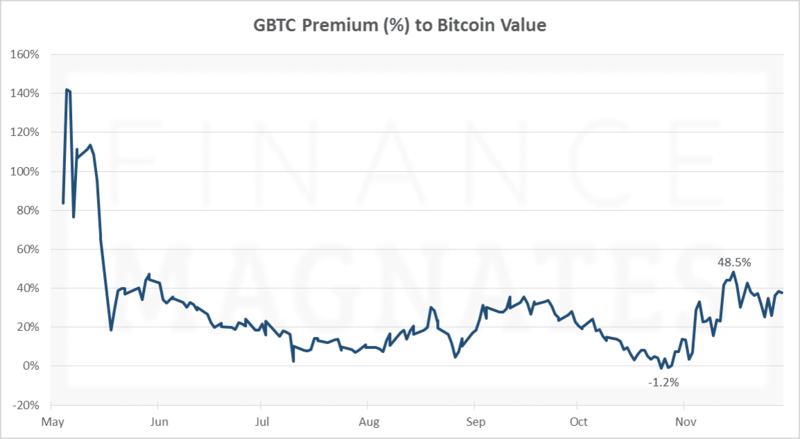 Shares of Bitcoin Investment Trust (OTCMKTS:GBTC) are trading at their highest premiums relative to their underlying bitcoin value since shortly after their public debut 6 months ago. In abbreviated trading on Bitcoin Black Friday, the shares closed higher by 11.96% at $47.00, playing catchup to bitcoin’s huge gains from the day before. Each share currently represents approximately 0.0959 BTC. Friday’s closing price implies an underlying bitcoin value of $490, which is a 36% premium to the actual bitcoin price of $359. Shares hit an intraday high of $51.50, their highest level since hitting $57.00 during bitcoin’s spike to $500 earlier in the month. Premiums have been rising in the wake of that spike, possibly a result of renewed investor appetite for one of the only regulated bitcoin instruments available to the public. When the shares became publicly available in May, investors initially paid premiums in excess of 100% to get their hands on them. The shares then quickly shed 80% of their premium, which has since typically hovered between 10% and 25%. When the bitcoin rally started to gain momentum in late October, GBTC failed to keep pace. At various points, the shares actually traded at a discount to their implied bitcoin value for the first time in their publicly traded history (weekends, when bitcoin trading continues but equity markets are closed, are not included). Thereafter, premiums reversed higher to well above typical levels, approaching 50% two weeks ago, and holding in the 35% to 40% range since. He also attributed bitcoin’s recent rise to concern over the US dollar’s use as a reserve currency. “China has been vocal about wanting an alternative to the US dollar, and this has many gloom/doom investors believing that they will engineer a collapse in the value of the dollar (relative to other currencies). These Armageddon-type investors tend to gravitate toward other ‘hard’ investments like gold,” he said. Other theories have been floated to explain the rally, including one blaming Chinese investors rushing to buy bitcoins for a Russian Ponzi scheme. The seemingly irrational GBTC price premiums, according to Ryder Taff, Portfolio Manager at Ridgeland, MS-based New Perspectives, stem from factors relating to available supply and demand. “Lack of liquidity, accessibility and transparency can all cause significant price dislocations. With the BTC Trust, it is far easier for people to access the trust than the underlying Bitcoin. With the pool of available money going into the trust faster than into Bitcoin, that price rises far off of its underlying value,” he told Finance Magnates. As to why the premium is maintained even when considering the equally relative ease with which the shares can be sold off, this too is a matter of supply and demand. “The supply of money ready to go into exchange traded investments, like the trust, is just much much greater than the supply of money ready to go into bitcoin, which, for all of the attention it gets, is still a very niche thing,“ he argued. 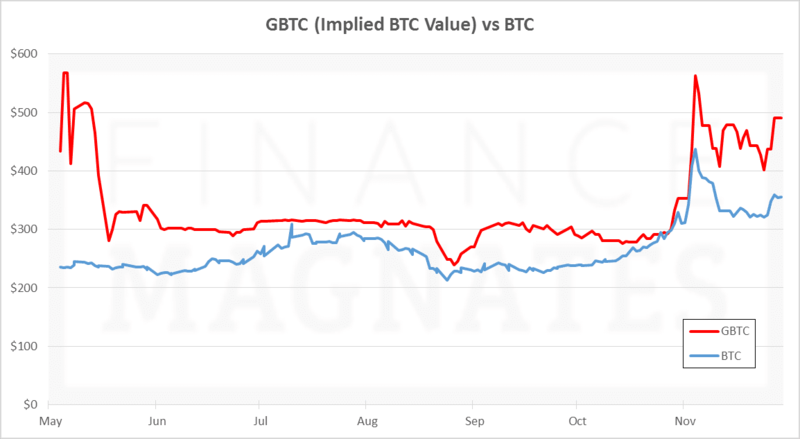 Also worth noting is that some of the notable movements in the GBTC premium value were in fact a result of delayed reactions by the shares to the bitcoin price. During the negative premiums one month ago, for example, the shares moved slightly lower even as bitcoin steadily climbed higher. The recent increases to premium levels may have therefore resulted from investor excitement in response to the big rally. In general, the price premium may also result from a ‘higher bitcoin value’ investors bake into the shares than bitcoin itself. GBTC is a regulated instrument and investors need not fear losses arising from hacking-related theft, unlike raw bitcoin, whose inherent risks may be factored by investors into its relative value. However, a number of other avenues exist that would seemingly also offer peace of mind. For example, shares of Bitcoin Tracker One are traded on the Stockholm Stock Exchange, and not for a hefty premium. There are also bitcoin wallet offerings that make hacking-related theft practically impossible, and some come with insurance.